I'm a busy girl. It goes without saying that as a mom of 6 that I have a ton on my plate. Add in the fact that I own my own business. I love my life. In order not to DROWN in my life I use planners. 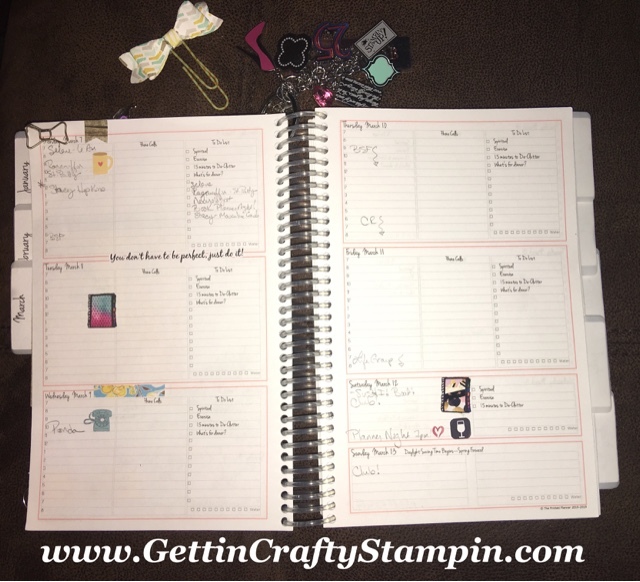 As a Planner Girl - I own and use TWO to just stay on-top of my schedule(s) and those of my husband and kids. 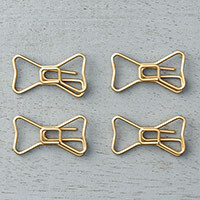 I add in cute accessories like our new Bow Paper Clips from the Occasions Catalog - they are a sweet and small little gold bow in a cute nod to my crafting and Kate Spade. Pretty big paper bows thanks to our Bow Builder Punch for a fun accent - I love a pretty bow, don't you? This week ended with a fun Friday Night Masculine Card Making Class. The weekend had an awesome two day boutique and craft fair at Borchard Park. I find that sometimes I can not remember who attended events, ordered what, took a class in-person or to-go. Not to mention what I may need to do as a list can be long. To stay on-top of my lists I need to add in a list that doesn't take over my schedule. It opens up! 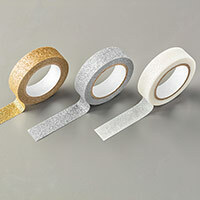 Taping on the Project Life card allows the list to tuck closed. 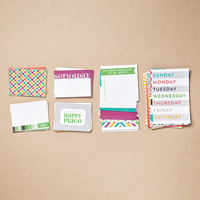 This is (a) more private (b) organizing connections or to-do's (c) tucks in so I don't snag and lose my notes (d) is so cute! As I focus on my business, I know that I have to track my activity to see where I'm focusing my time, where I need to focus, etc. 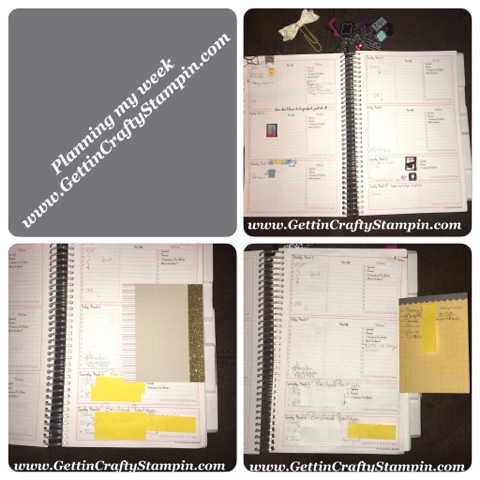 I am a Planner Girl and proud of it! 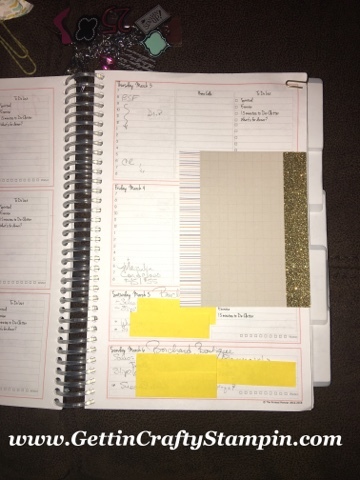 So as I plan out my week, I add in pretty accents like bows, gold glitter metallics tape and extra lists that will not be lost. 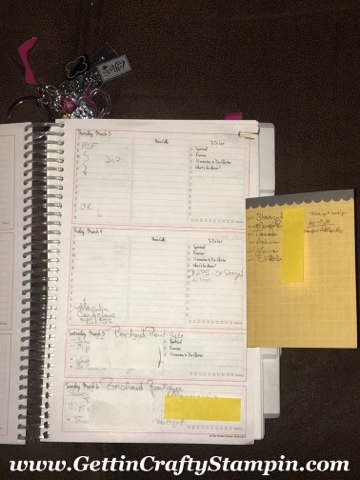 I review my activity in sales, contacts and more (covered in post-it-notes - sorry). This gives me a real focus of the past week. Shows me that I was/am busy and where I am. (So when my husband asks what I've done all week - I can look, see and remember.) I look forward to a New Week - one I've looked ahead and am planning versus reacting. Go ahead - join me and create, organize and jump into some fun!